If you are a frequent traveler who struggles with leg and foot fatigue and swelling, you just may find that Cabeau's Bamboo Compression Socks can help you stay comfortable on-the-go. As someone who spends a lot of time traveling by plane and car, I was very happy to have an opportunity to review these unique socks. As a corporate training professional, I spend a lot of time traveling to client locations, and I also frequently stand for hours (often on concrete floors) while teaching workshops. So, it's not surprising that I often experience leg and foot swelling, as well as fatigue in these areas. I have to admit that I was a bit skeptical whether these socks might be able to provide some relief before trying them. However, after testing them during a few trips, I can now say that I definitely see the benefit. 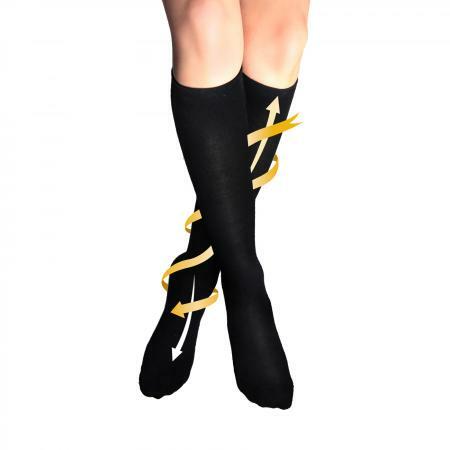 These socks are specially designed to apply "gentle systemic pressure to the lower legs," says Cabeau. This is beneficial when sitting and standing for an extended time period, as, according to Cabeau, it can have a positive impact on circulation in your legs and feet, thereby diminishing swelling in these areas as well as discomfort. Cabeau's product literature indicates that this improved circulation in the lower extremities, in turn, can help increase blood flow upwards, toward your heart. How does this benefit you? In addition to preventing or reducing swelling related to travel or extended travel, this can also lead to reduced fatigue and improved energy. I wore these socks during a few flights and car trips, as well as while teaching a few half- and full-day classes. I won't say that I experienced zero fatigue and swelling, but I will say that I could definitely see an improvement over the way I usually feel in these situations. I didn't do anything different from usual other than to wear these socks, so I can only assume that they had a positive impact. I am not the only one who thinks so, as one Amazon reviewer states "these are the best compression socks I've tried" and another describes them as "a God send." In addition to experiencing less swelling and fatigue after long days of traveling and standing, I found these compression socks to be quite comfortable. The fabric is very soft (likely due to the bamboo). The fabric is also moisture wicking, which is a great feature for people who tend to be hot natured or experience hot flashes (like me - guilty on both accounts! ), and anti-microbial. They seem to be well-worth the $19.99 price tag. These socks are snug - after all, they are compression socks. You should feel a bit like they are massaging your legs and feet, but they should not be so tight that you feel like you are being squeezed. They come in two different sizes (medium and large), so you aren't stuck with one-size fits-all construction. Medium: Fits men's sizes five through nine and women's sizes six through ten. Large: Fits men and women who wear larger shoe sizes. While these socks can be great for people who travel a lot, that is not their only use. For example, one of the favorable reviews on Cabeau's website indicates that they are a great option for medical professionals, as they spend many hours walking throughout the workday. These socks are not intended for young children. Only people over the age of 13 should consider wearing them. It is also important to wear them pulled all the way up. You should not roll them, nor should you fold over the top band. If you have (or potentially have) any related medical conditions, it is advisable to consult with your physician before wearing any compression garments.